One moment in January, Scott was trying on his personalized pair of All-Star gloves in Arizona. The next, the Coyotes traded Scott to Montreal, where he was immediately shipped to St. John's. There were still some nine minutes remaining in the third period when the excited mob of youngsters began gathering outside the St. John's IceCaps locker-room door. "I think I saw him!" someone gasped, peering through the dimly lit maze of iron supports beneath the dusty stands of Syracuse's War Memorial Arena before a security person shooed them away. The scene was no different the night before, when extra security personnel were called in for crowd control. "It's almost like a movie," a smiling Scott said, reflecting back on the past two months. "Honestly, no one could ever script this would happen." "I'm a super lucky guy with all that's happened," he said. If that sounds odd, it should: One moment in January, Scott was trying on his personalized pair of all-star gloves in Arizona. The next, the Coyotes traded Scott to Montreal, where he was immediately shipped to the American Hockey League's remotest outpost in St. John's. A few weeks later, the 33-year-old Scott was being hoisted on his teammates' shoulders amid fans chanting "M-V-P!" after he captained the NHL's Pacific Division team to an all-star title in Nashville, Tennessee. "As soon as I got there, everybody was super friendly," he said. "I walk down the street and it's, 'Hey, John. Congrats. Hey, we'll meet you for a beer later.' It's so fun. I love that city." And yes, Scott has been, as the locals put it, "screeched in." It's a long-held rite of passage for newcomers to kiss a fish (usually a cod), drink a shot of rum (known as screech) and recite a saying that ends with "long may your big jib draw," which translates to: "May your sails always catch wind." The big forward, who has two goals and two assists in 21 games through last weekend, plays a regular shift, including a role on the power play. He can also double as a defenceman, as happened Sunday when St. John's Brett Lernout was ejected in the first period. 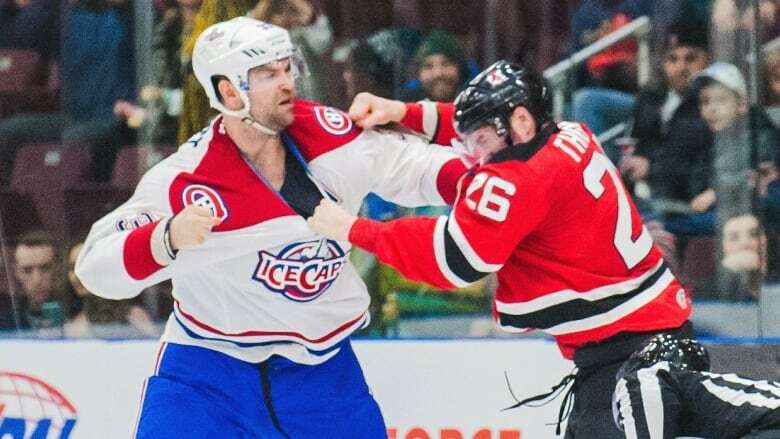 "It's not an easy situation for him, but he's making the most of it," IceCaps coach Sylvain Lefebvre said. "He's a big brother, as he should be in the locker room. And the guys enjoy being around him. That's a big tribute to him." The most amusing moment on Sunday came shortly before he picked up his 10-minute major. With a scuffle erupting next to him, Scott skated over and matched up with the only Syracuse player without a partner. It happened to be 5-foot-9 defenceman Matt Taormina. "Everybody wants me to be this bad guy," Scott said. "It's like, 'There's John, this mean guy. He's like a goon. He's not smart.' And that's just not who I am. I'm a nice guy." Scott has never pretended to be anything more than being a role player. He's earned a professional paycheque because he poses a big, intimidating on-ice presence. He has just five goals and 11 points to go along with 542 penalty minutes in 285 NHL games. "It's just funny," she added. "What ended up being one of our hardest moments turns into the greatest beyond what we ever could have expected." "Yeah, an MVP All-Star," he said, correcting someone. "I haven't gotten it yet," Scott said, referring to the money. "That's actually a good question. I've got to follow up with them on that one," he added, with a carefree shrug before ducking back into the locker room. "You know what, even if the whole thing didn't go down the way it did, I'm not going to complain," Scott said. "I was super lucky before all this stuff. But after this, it's like, holy. I must have six or seven angels looking out for me. I'm so blessed."